The Olieboomskraal Project consists of seven small farmers from Slangrivier who lease 233 hectares of the Slangrivier commonage. 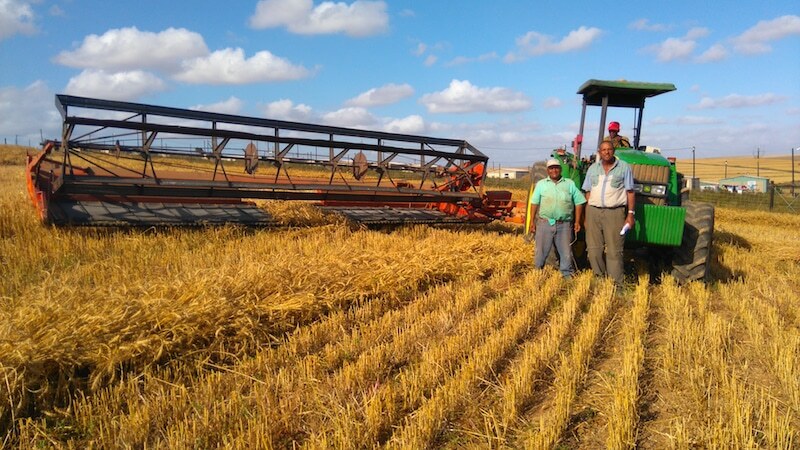 In 2015/16, these farmers were funded by the Western Cape Department of Agriculture through the Grain CPAC to clear the overgrown fields and to plant wheat. A small percentage of the income was distributed to the farmers and the bulk will remain in their bank account at Sentraal-Suid Co-operative, which will be used to establish canola in 2017. Furthermore, an application was approved at the Grain CPAC to finance a portion of the 2017 inputs and continue to reduce the funding every year until the farmers are independent. According to Casidra’s Manager: Regional, Johan Bronkhorst, these farmers had a very successful harvest and exceeded expectations. The project implementing team consists of the seven farmers, their mentor, Jeff Wessels, the WCDoA, Grain SA, Sentraal-Suid Co-operative and Casidra. In celebration and appreciation of the great harvest, the farmers invited all their key role-players and presented them with certificates of appreciation.